2017 build MY17 major update 'pumped up 6 speed 430Nm' model, under factory warranty to 2022 (transferable), nil insurance claim history, 62,605kms, VGC with RWC. Genuine steel bull bar and tow bar kit, big 1800L (internal) x 1842W heavy duty alloy dropside body with ladder rack kit. 3.0L turbo diesel, auto (6 sp) 5 star ANCAP safety rating, cruise control, air cond, power steer, power windows & mirrors, Bluetooth, centre console, seats 5 with 3 x child safety anchorage points to rear of cab. Virtually unmarked underneath, 4 new A/T tyres, very recently serviced, no money to spend. Only $33,990.00 ono gst inclusive ex Townsville Nth Qld. Company owned vehicle bought new by us. Can arrange cheap freight north or south. For more obligation free info ring or sms Michael on 0419 793 232. 2016, only 92,515kms, balance of 5yr / 200,000km factory warranty, reversing camera! 1 owner Canter 515 City Cab MWB in absolutely top condition, light sealed road use only, located Townsville NQ. For obligation free additional info & photos sms or ring Michael 0419 793 232. Cheap rego / auto car licence! Current series truck with independent front suspension for a great ride, disc brakes all round, and a brand new 4.2 x 2.122M heavy duty dropside body with ladder racks (genuine 2 tonne + payload), very good tyres. Low fuel consumption + 30,000km service intervals for low running costs (90k service just completed)! No accident claim / flood or hail damage history. Only $35,500.00 ono - includes gst, Qld RWC, balance of current rego, log books and spare keys. Private sale - many extras! Window tint (3M, darkest legal), 19" Walkinshaw alloys, blackout panels to bonnet (professionally painted - not decals), steel bull bar, snorkel, H/D transmission guard, All Weather rubber floor mats, tow bar (3,000kg towing capacity). 5 star safety rated, 2.8L turbo diesel, 6sp auto trans with high & low range, side steps, dual air conditioning, cruise control, Bluetooth, reversing camera. No rust / hail / flood damage, nil accident claim history. One company owner, 72,697kms, excellent condition inside and out, virtually unmarked underneath, balance of new car factory warranty to July (transferable). Asking $30,990.00 gst inclusive all offers considered. Includes Qld RWC and balance of current rego. Can arrange cheap freight north or south. For more info & photos sms or ring Michael 0419 793 232. Not a dealer. 2017 build MY17 major update 'pumped up 6 speed 430Nm' model, under factory warranty to 2022 (transferable), nil insurance claim history, 66,895kms, VGC with RWC. Genuine steel bull bar and tow bar kit, big 1800L (internal) x 1842W heavy duty alloy dropside body with ladder rack kit. 3.0L turbo diesel, auto (6 sp) 5 star ANCAP safety rating, cruise control, air cond, power steer, power windows & mirrors, Bluetooth, centre console, seats 5 with 3 x child safety anchorage points to rear of cab. Virtually unmarked underneath, good tyres, recently serviced, no money to spend. Only $34,500.00 ono gst inclusive ex Townsville Nth Qld. Company owned vehicle bought new by us. Can arrange cheap freight north or south. For more obligation free info ring or sms Michael on 0419 793 232. One (company) owner very clean & tidy car with no flood, hail or accident claim history! Located Townsville but can arrange cheap freight eg Brisbane $450.00. Very stylish sedan (much bigger boot area than hatch version) with 60/40 split fold rear seat. Great car to drive with zippy 1.8L DOHC Efi petrol engine, smooth 6 speed automatic transmission and 4 cylinder economy! 'Planet Blue' (Grey with a blue tinge) metallic, keyless central locking, 5 star safety, Bluetooth, cruise, power windows, etc. Only 80,405kms, excellent condition, balance of current Qld rego, RWC, asking $12,450.00 gst inclusive. Private sale - ring or sms Michael 0419 793 232 for an obligation free response. SMS your direct email address for more photos and info. Many extras, priced to sell! One owner 2016 build MY16 7 seat 4x4 wagon, 18" alloys, near new tyres, H/D transmission guard, All Weather rubber floor mats, tow bar (3,000kg towing capacity) - 500Nm torque gives more towing power than Ranger, Prado & Dmax! 5 star safety rated, 2.8L turbo diesel, 6sp auto trans with high & low range, side steps, dual air conditioning, cruise control, Bluetooth, reversing camera. No rust / hail / flood damage, nil accident claim history. Only 72,071kms, excellent condition inside and out, virtually unmarked underneath, balance of new car factory warranty to May 2019 (transferable). Only $29,500.00 inclusive of gst, Qld RWC and rego to 05/2019. Can arrange cheap freight north or south. For more info & photos sms or ring Michael 0419 793 232. Not a dealer. 1 commercial owner not a dealer - '12 Toyota Commuter 12 seat (car lic / cheap rego), turbo diesel / auto, bull bar / tow bar update model with ABS brakes and reversing camera. Can be taken back up to 14 seat but truck licence then required. Dual air conditioning, power steer, power front windows, central locking, radio/CD player. 121,396 kms, good condition, excellent upholstery & floor mats, recently serviced, excellent road tyres, Qld RWC, balance of current rego to July, log books, spare key, located Townsville NQ, only $28,500.00 ono gst inclusive. Can arrange relocation to southern centres. Sms or ring Michael 0419 793 232 for full details. Late 2016 build MY17 major update model (excellent reviews), many extras, 1 owner purchased new 10/2016, still under factory warranty (transferable), nil insurance claim flood / hail history, only 67,441kms, VGC with RWC. Genuine Holden alloy wheels, steel bull bar and tow bar kit, big 1800L (internal) x 1842W heavy duty alloy dropside body with ladder rack. 2.8L turbo diesel, auto (500Nm - more get up & go than Hilux, Dmax, Ranger & Nissan! ), 5 star ANCAP safety rating, cruise control, air cond, power steer, power windows & mirrors, Bluetooth, centre console, seats 5 with 3 x child safety anchorage points to rear of cab. Virtually unmarked underneath, near new road tyres, recently serviced, no money to spend. Only $32,990.00 ono gst inclusive ex Townsville Nth Qld. Company owned vehicle bought new by us. Can arrange cheap freight north or south. For more obligation free info sms or ring Michael on 0419 793 232. Low km (58,725) 2015 build MY15 under wty to 2020! No flood, hail or insurance claim history! Turbo diesel / 5sp manual, TJM T15 steel bull bar + snorkel with pre-filter + sump guard + tow bar + dropside body + alloys + side steps! One owner, balance of 5yr / 130,000km factory warranty (transferable) to 2020, just serviced, new Bridgestone Dueller road tyres, VSC, 6 airbags, Bluetooth, cruise. Located Townsville can arrange cheap freight south. For more info & photos sms or ring Michael 0419 793 232. Very clean & tidy low km ute with many extras, for only $24,990 or near offer including gst, RWC & balance of current Qld rego to 06/2019! 7 seat, 7,995kg GVM - LR truck licence all you need! Factory dropside tipper, tow bar with combo coupling & electric trailer brakes, headframe with shovel brackets and dual amber beacons, GME UHF 2 way radio. 4.0L turbo diesel, 6 sp manual, air conditioned front & rear, Sat Nav, reversing camera, very good condition inside and out, excellent tyres, recently serviced no money to spend! No flood or hail damage history. Only $49,900.00 ono - includes gst, balance of current rego, log books and spare keys. Located Townsville NQ. For obligation free additional info & photos sms or ring Michael 0419 793 232. 2017 build MY17 major update 'pumped up 6 speed 430Nm' model, under factory warranty to 2022 (transferable), nil insurance claim history, 68,833kms, VGC with RWC. Genuine steel bull bar and tow bar kit, big 1800L (internal) x 1842W heavy duty alloy dropside body with ladder rack kit. 3.0L turbo diesel, auto (6 sp) 5 star ANCAP safety rating, cruise control, air cond, power steer, power windows & mirrors, Bluetooth, centre console, seats 5 with 3 x child safety anchorage points to rear of cab. Virtually unmarked underneath, good tyres, recently serviced, no money to spend. Only $34,500.00 ono gst inclusive ex Townsville Nth Qld. Company owned vehicle bought new by us. Can arrange cheap freight north or south. For more obligation free info ring or sms Michael on 0419 793 232. 2015 Compliance MY 14.5 FWD 5 seat petrol auto, vgc, cool white, reversing camera, 5 star safety rating, under factory warrant to 2020! Great family car with huge luggage area, 2.0L efi unleaded petrol, factory 18" alloys, air conditioned, power steer, power windows, cruise, Bluetooth, touch screen, 60/40 split fold rear seat with lay flat feature! One owner, no rust / hail / flood damage, nil insurance claim history, only 78,464kms, excellent condition inside and out, Only $17,990 inclusive of gst, Qld RWC and balance of current rego, ex Townsville - can arrange cheap freight north or south. For more info & photos sms or ring Michael 0419 793 232. Not a dealer. Hi-Rider high clearance ute with turbo diesel power & economy, H/Duty dropside with ladder rack, tow bar! Balance of factory wty to 2020 (or 130,000kms). Excellent condition inside and out and underneath, very recently serviced, no money to spend! No flood, hail or insurance claim history. For more info & photos sms or ring Michael 0419 793 232. Economical 2.5L 4 cylinder turbo diesel, 5 speed manual trans, central locking, airconditioned, power windows, bucket seats (seats 2), full size Triple M dropside body (ie not the el cheapo narrow version offered by dealers), tow bar (2,500kg towing capacity). 91,275 kms, and is in terrific condition! Pre-purchase inspection by professional workshop welcome! Only $15,990 ono gst inclusive ex Townsville. Can arrange cheap freight north or south. Not a dealer. Immac late 2015, only 88,015kms, brand new dropside body, balance 5yr factory warranty, reversing camera! 1 owner Canter 515 City Cab MWB in absolutely top condition, light sealed road use only, located Townsville NQ. For obligation free additional info & photos sms or ring Michael 0419 793 232. Cheap rego / auto car licence! Current series truck with independent front suspension for a great ride, disc brakes all round, and a brand new 4.2 x 2.122M heavy duty dropside body with ladder racks (genuine 2 tonne + payload). Low fuel consumption + 30,000km service intervals for low running costs (90k service just completed)! No accident claim / flood or hail damage history. Only $34,990.00 ono - includes gst, Qld RWC, balance of current rego, log books and spare keys. One owner 2016 build MY16 7 seat 4x4 wagon, many extras including 18" alloys, bonnet blackouts (professionally painted - not cheap stickers), bull bar, light bar, snorkel kit, H/D transmission guard, All Weather rubber floor mats, tow bar (3,000kg towing capacity) - 500Nm torque gives more towing grunt than Ranger, Prado & Dmax! 5 star safety rated, 2.8L turbo diesel, 6sp auto trans with high & low range, side steps, dual air conditioning, cruise control, Bluetooth, reversing camera. Very recently serviced, no rust / hail / flood damage, nil accident claim history. Only 64,405kms, excellent condition inside and out, virtually unmarked underneath, balance of new car factory warranty to April 2019 (transferable). Only $31,500 ono gst inclusive, Qld RWC and rego to 04/2019. Can arrange cheap freight north or south. For more info & photos sms or ring David 0418 188 871. Not a dealer. Priced to sell - in great condition! MY14 bought new 04/2014, 82,377kms, powerful & economical 2.0L 4 cylinder turbo intercooled diesel. Large 80L tank, 7.8L/100kms combined fuel rating gives excellent range, rear wheel drive, 16" factory alloy wheels, 7 seats in a 2 2 3 configeration, easy access to 3rd row seat via centre isle, dual airconditioning, front /side & side curtain air bags, cruise, reversing sensors, Bluetooth. Very recently serviced, no rust/ hail / flood damage. VGC inside and out, only $13,990 ono gst inclusive, QLD Rego to 09/2018. Can arrange cheap freight north or south. For more infor & photos sms or ring Michael 0419 793 232. Not a dealer. 2009 Toyota Coaster Deluxe 21 seat bus, only 141,882kms, 4.0L turbo intercooled diesel, 5 speed manual trans, ducted air-conditioning, bull bar, tow bar, UHF 2 way radio, excellent panel & paint, cloth faced high back seats with seat belts, fresh Machinery Certificate, GC, Qld rego to 10/2018, only $41,500.000 ono gst inclusive. Located Cairns. Not a dealer. For more info ring or sms Michael on 0419 793 232. Isuzu 4HK1 5.2L Sitec 185 turbo diesel engine #629344 ex 2008 NQR 450 for parts or restoration $1,500.00 GST incl. 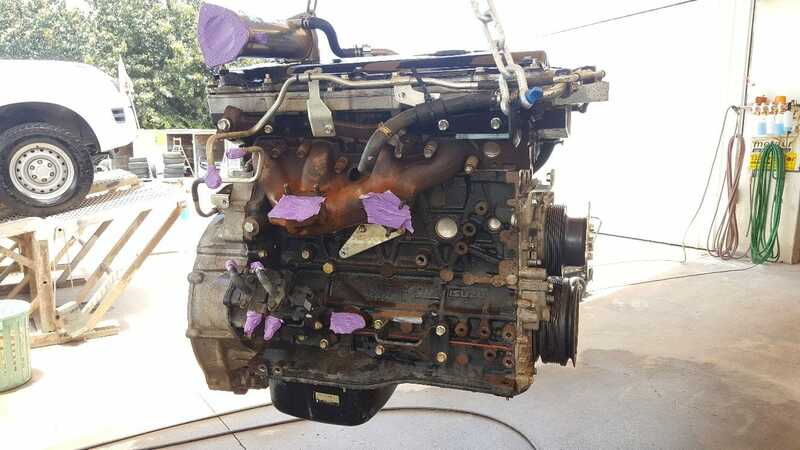 Isuzu 4HK1 5.2L Sitec 185 turbo diesel engine #629344 ex 2008 NQR 450 for parts or restoration, 78,000kms when overheated, includes pump and injectors $1,500.00 gst inclusive ex Townsville NQ (in box on pallet) ph or sms Michael 0419 793 232.